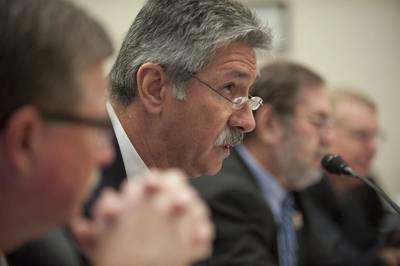 Today, United States Steel Corporation President and CEO Mario Longhi joined fellow steel industry executives and Leo Gerard, international president of the United Steelworkers, in pressing Congress to maintain America’s economic and national security by halting unfair trade practices and enforcing the country’s trade laws. Longhi encouraged action against illegal dumping of Oil Country Tubular Goods by South Korea and others who threaten American jobs, infrastructure and our national security. While testifying before the Congressional Steel Caucus, Longhi emphasized that the issue of fair trade is “a matter of utmost importance to our employees, our company, our industry and our country.” U.S. Steel employs more than 24,000 employees domestically and is the nation’s largest producer of tubular products headquartered in the United States. U. S. Steel’s domestic position in the tubular market makes the “alarmingly rapid and intense surge of imported OCTG (Oil Country Tubular Goods) products into the market” to be of particular concern he stated.